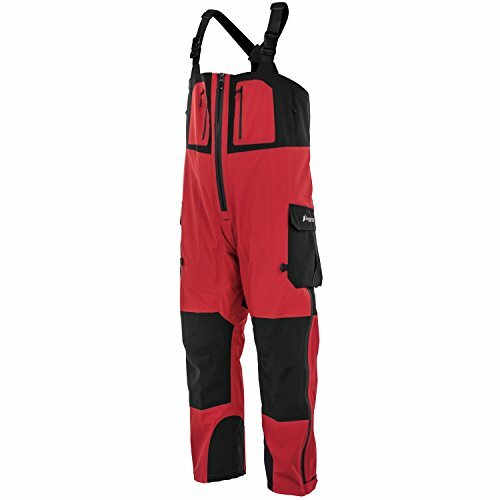 What is an Ice Fishing Bib Used For? Does it Have Padded Knees? Have you ever experienced the extreme shock of freezing cold water rushing into your fishing boots as you stepped through some thin ice on a cold winter’s day? If you have, you’ll appreciate the importance of the right fishing bib to keep you safe, warm, and dry while ice angling. We’ll break down the factors you should consider when buying an ice bib and also share our top picks for the best ice fishing bibs that will protect you from the elements on a trip. Like every recreational activity, ice fishing becomes more enjoyable and rewarding when you have the right equipment. Because ice fishing is often done in bitterly cold conditions, keeping warm and dry is paramount in order to safely enjoy your day. 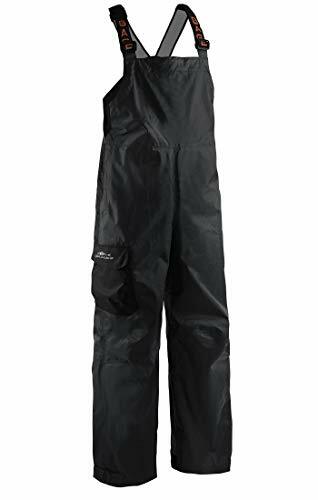 Ice fishing bibs are specifically designed for this activity, with plenty of insulation and other features to keep you dry and warm in freezing or sub-zero temperatures. While standing or sitting still for long periods of time while fishing, you have a high risk of frostbite or hypothermia if your body is exposed to the biting winds, cold air, and water. Ice bibs will protect you from getting hurt or sick due to the cold weather and you should definitely consider getting one for your next ice fishing expedition. Not all ice fishing bibs are created equally. Some emphasize durability and insulation while others have extra features that can come in handy for some fishermen. Let’s look at the factors that will influence your decision on which one to get. Insulation is important for your ice fishing trips because standing in biting cold winds will deprive you of body heat very quickly. The wind chill factor, combined with already freezing temperatures, can lead to hypothermia or frostbite. A well-insulated bib will prevent you from losing body heat and will allow you to withstand harsh weather. Look for bibs with Thinsulate or fleece linings. Not every bib is designed to float. This feature proves its worth when you fall into the water and need to stay afloat. They may look like any other ice fishing bib, but floating bibs can save your life! Just as the bib should keep you warm, it also needs to keep out the rain, snow, and water. Look for a bib that has a waterproof coating or layer. With differing levels of waterproofing available, you should check what level of water protection is offered by the bib before you purchase. Bibs will provide you protection from rain ranging from a light drizzle to a heavy downpour. Angling requires sitting, standing, and kneeling on occasion, so having reinforced knees on your bib will help protect your knees in case you fall or need to kneel on the ice. For increased visibility at night, it is recommended to get a bib with reflective tape or lining. This will make you safer when angling in the dark. Try to get a bib that’s lightweight, so you will not experience issues in moving around freely. It should also be durable, comfortable, and have room for layers of clothing underneath. Depending on the weather, you might need additional clothing underneath the bib for additional insulation. We’ve gone through the many options available in the market and rounded up the best ones. Our top pick is the Tundra Bib from Arctix, which is made of 100% Polyester Ballistic and contains W/R + W/P 5000mm ThermaLock Coating and 85 grams of ThermaTech Insulation. The bib is both lightweight and warm, with plenty of padding and reinforcement at the points where you may experience wear and tear. The 20" boot zipper makes removing and putting on shoes easy and the trouser legs integrate seamlessly with boots to keep warmth in and moisture out. For increased comfort, the bibs have zippered hand-warmer pockets and feature reflective safety webbing for night visibility. The 85 grams of ThermaTech insulation keeps you cozy in the coldest weather. Aside from that, the bib is breathable and windproof. These relaxed-fit pants are machine washable, making them perfect for outdoor activities. Offering great value, this bib is the perfect one for the ice fishing enthusiast who values comfort and safety and will not compromise on quality. 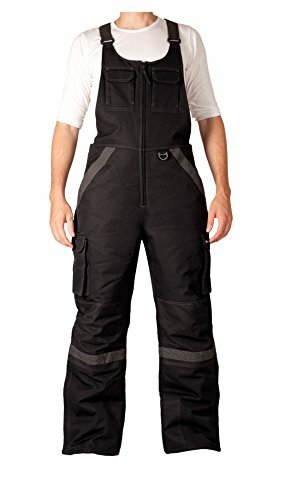 This bib is waterproof, windproof, and breathable, with a 300 denier nylon shell, YKK Zippers, 500 denier nylon reinforced knees and pant cuffs, 150g 3M Thinsulate insulation, and full elastic shoulder straps with cam lock buckles. For additional durability, the bib has internal knee and seat padding, and for comfort, it has hand warmer pockets and zipper vents for temperature regulation. You can put away your gadgets and gear in the spacious cargo pockets, and stay safe at night with the 3M Scotchlite reflective material. It includes a self-rescue set: ice pick holsters, ice safety internal label, and drainage mesh. With plenty of insulation and other features, this bib is no slouch! Opt for the Frabill I3 if you need a warm, comfortable, and waterproof bib for all kinds of weather conditions. The Pilot Frogg Guide bibs are designed for the worst weather conditions and are both waterproof and breathable. They are made from 3-layer submersible material, with 100% seam sealed, full-zip front entry, and thigh-length leg zips for putting them on and taking them off easily. In addition, you can adjust the Y-suspenders and waist for a more comfortable fit. They are lightweight enough for mobility while giving you storage options via the expandable cargo pockets and zippered chest storage pockets. While it doesn’t have much insulation, this bib will protect you from the elements and can fit layers of clothes within to ensure you stay toasty on the coldest days. It is not as durable as some others, though, so factor that in if you plan to use it for a long time. Made from 100% polyester, this bib has adjustable shoulder straps, a vented back panel, and two fleece-lined chest hand-warmer rests. Combined with the matching jacket, this waterproof bib can provide almost head-to-toe protection in even the harshest weather. The bib uses an abrasion-resistant material in high contact areas, features 3M reflective graphics, and nearly five pounds of positive buoyancy. So you can now enjoy warmth, flotation, and flexibility in one great package. With plenty of insulation and extra features like positive buoyancy, this bib gives great value and will be an asset to any angler in rough weather. Just double check the size with the seller before purchasing, as their stated sizing may not be reliable. The Weather Watch Bib is made from 8k/3k waterproof, breathable, 420D Nylon Oxford weave fabric. 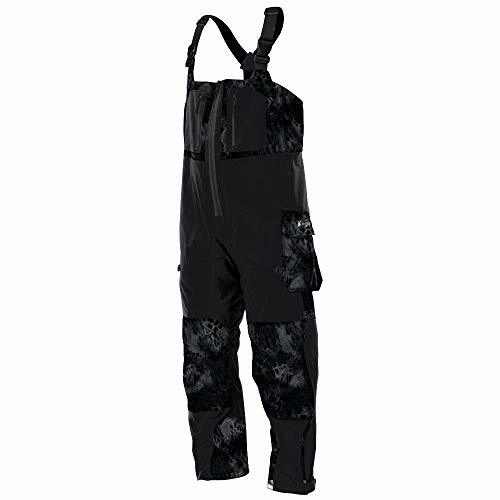 It has fully taped seams, adjustable suspenders, and the hook-and-loop cinch ankle closures are adjustable. It offers plenty of storage in the leg cargo pocket and interior zippered chest pocket. Being light, yet tough, the bib is durable and provides protection against the elements while the breathable construction prevents sweating and overheating. It can be rolled into a tight bundle and yet covers all of you and performs well in the heaviest of rains. Choose this bib if you plan to wear layers inside, and are looking for something that works in both cold and warm weather. It is great for outdoor activities that involve exposure to the elements and will keep you dry and comfortable in all sorts of rainy weather. This bib comes in bright and vivid colors and has plenty of insulation for keeping you warm while ice fishing. Offering comfort, mobility, and convenience, the bib has a tough 300D waterproof, windproof, breathable shell, and reinforced and padded, 1,000D ballistic nylon knee patches which make kneeling more comfortable. Ease of use is enhanced by the 2-way front zipper, fleece-lined hand-warmer pockets, long 2-way leg zips, adjustable inseam system with storm gaiters, and adjustable nylon suspenders with quick-release clasps. There’s even a built-in rapid drainage system for wet or slushy days. The fitting of the bib is also comfortable and allows for easy movement. While not ideal for extreme cold, this bib will keep you warm in sub-zero temperatures and you can add additional layers inside if needed. The well-padded and thoughtfully designed bib is sure to be a great hit with ice anglers looking for some storage for their tools and equipment. 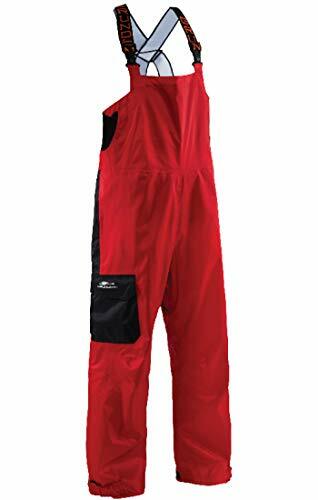 With several options for ice fishing bibs made from modern materials that will keep you both warm and comfortable, you have no more excuses to get cold or wet this ice fishing season. So what are you waiting for? Just keep in mind our tips for selecting the right bib while shopping for an ice fishing bib so that it offers the right features. Go for bibs that are well insulated, waterproof, and float, so that you remain safe and comfortable while having fun fishing on the ice.